On a beautiful day in a town in Northern Texas the saying that ‘everything is bigger in Texas’ just became more real. Bowie, Texas is the home of 5,000 inhabitants and as of yesterday, the world’s largest Bowie knife. 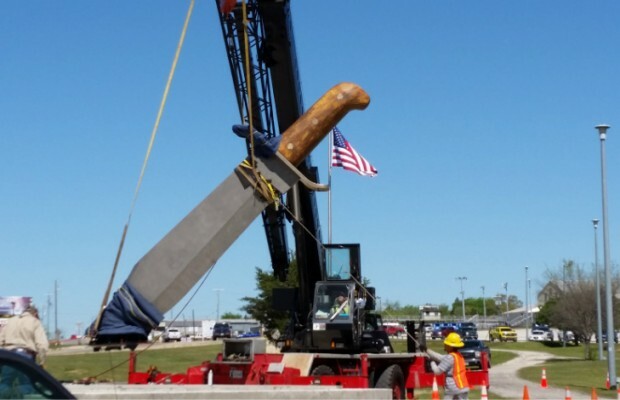 The knife is over 20 feet long, features a 14 foot and 5 inch Bowie style stainless steel blade, weighs in at over 3,000 lbs, and required a crane to install. The handle was fabricated out of an enormous limb pruned from a nearby bodark tree. According to organizers, the blade now perched in Pelham Park has not been sharpened in case someone ever tried to climb it. The giant knife doesn’t come with a matching leather sheath either – there might not be enough cattle in Texas to produce one.